Stanley John Sumsion, known as Jack, was born in Yeovil in the spring of 1889 and baptised at Holy Trinity church on 2 September 1889. At this time the family were living at Park Street. He was one of the twelve children of glover George Sumsion (1846-1910), originally from Bath, and Louisa née Patten (1850-1938). George and Louisa's children were Ellen (b1874), George (1876-1952), Walter John (1878-1929). Lily (1880-1972), William (1882-1959), Henry (1884-1959), Rose (1887-1954), Jack, Ruth Flossie (1891-1961), Naomi Maud (1891-1979), Ethel Annie (b1893) and Reginald Arthur Theodore (1895-1926). In the 1891 census the family were living at 100 Park Street but had moved to 3 CeCecil Street by 1901. In this record 12-year old Jack was recorded as John, showing that even as a child he wasn't called Stanley. George Sumsion died in 1910 and in the 1911 census Louisa, recorded as a widow, was still living at 3 Cecil Street with children Walter, Rose, Jack (recorded as Stanley John), Naomi, Ruth, Ethel and Reginald. Jack gave his occupation as a glove cutter; he worked at Whitby's glove factory. Jack enlisted at Yeovil on 11 October 1916. Initially he served as a Private in the East Surrey Regiment, with the Service Number 204053. He was later transferred to the 8th (Irish) Battalion, The King's (Liverpool Regiment). His new Service Number was 53477. The 8th Battalion was a unit of the Territorial Force which had proceeded to France on 3 May 1915, landing at Boulogne, moving to Flanders in October 1916 where they took over the front line between Wieltje and Railway Wood. Jack was posted to France to join his battalion on 15 September 1917. However, he returned to England to recover from trench feet in December 1917. He returned to his unit in France on 15 June 1918. Jack did not fight in any of the large, well-known battles of the Great War but simply endured the horrendous day-to-day existence of life in the trenches. He was killed in action on 11 September 1918, just a few weeks before the Armistice. Jack was 29 years old. 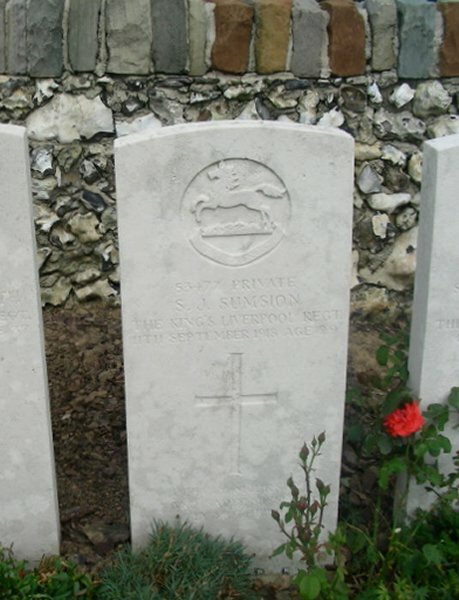 The Western Gazette, in its edition of 27 September 1918 reported "Private John Sumsion, King’s (Liverpool Irish) Regiment, son of Mrs Sumsion, of Gordon Road, was killed in action on 11th September. Deceased, who was 29 years of age, joined on October 11th 1916, and went to France September 15th 1917, came home with trench feet in December 1917, and returned to France, June 15th 1918. In a letter to Mrs Sumsion, his platoon sergeant says:- “ I was present when he was carried in and he is buried in a soldier’s grave (a British cemetery). Private Sumsion before joining up was employed as a glove cutter at Messrs. Whitby’s factory." 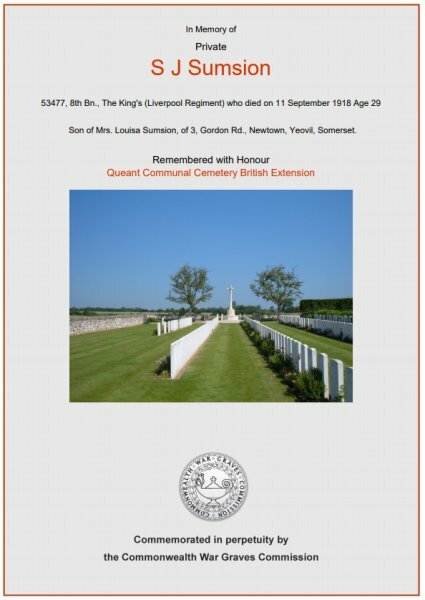 Jack Sumsion was interred in Queant Communal Cemetery British Extension, Pas de Calais, France, Grave A.16 and his name is inscribed on the War Memorial in the Borough. The record of Jack's baptism from the Holy Trinity parish register. Jack Sumsion's Commonwealth War Graves Commission headstone. The Commonwealth War Graves Commission certificate in memory of Jack Sumsion.